On November 10th, we had a Home of the Mother get-together in a town of Fermo. 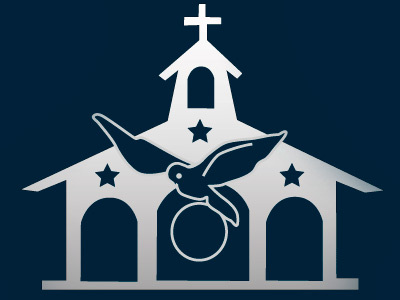 There were two married couples with their children, 5 sisters and some youth who came to the encounter. 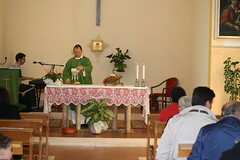 We began the day with Mass at 10:00 a.m. in the parish of Collina, a nearby town. 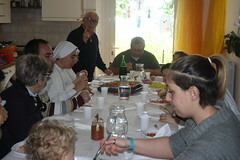 After Mass, we went to the house of Angelo and Lidia, members of the Home of the Mother, to spend the rest of the day there. We had a meeting with the adults about: "The man created in image and likeness of God", using what the Catechism of the Catholic Church says about this. We touched on many topics: the dignity of man, the life of grace, etc., discussing also the practical side: How can we live in this dimension without being soffocated by the worldliness that exists around us? How can we live the things of each day in a supernatural way? Is is possible to go against the current? We all contributed with examples from our personal experience to encourage and enrich each other mutually. At the same time, the kids had their own meeting, in which they spoke about many things: the angels, the saints... They also played, sang songs and made a craft. Even the littlest one tried to color her own drawing. Later we had lunch, sharing what each one had brought. Through a very warm and friendly environment, we had the opportunity to get to know each other more. Lastly we prayed together a decade of the rosary to Our Blessed Mother, interceding for the intentions of the Holy Father, the world, and the Home. And with this done we gave thanks to God for having permitted us to be together and to share our experiences, saying good-bye until the next encounter.